WARNING. If blade damage, don’t be fly. otherwise it will create the human body or blame damage. Drone Zone is now listed on the Indie DB! Drone Zone is up and live on the Indie DB site. Indie DB offers us another opportunity to showcase the game, offer downloads and allow you, the community to help us develop it through the forums, etc. Please have a look! 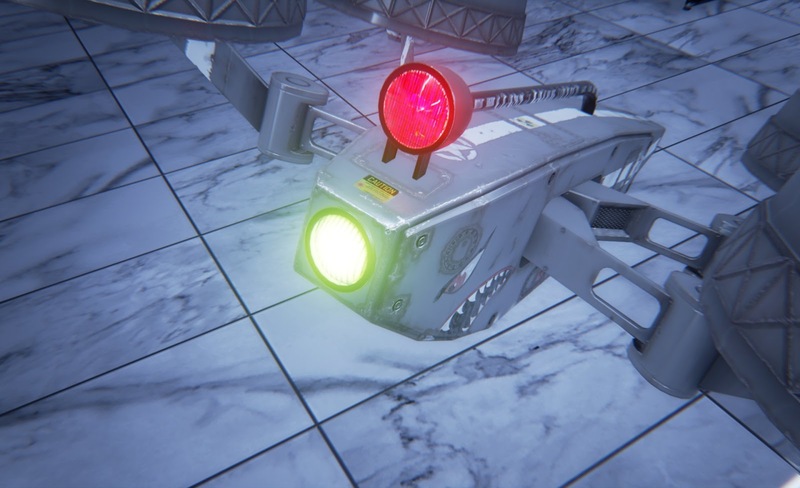 As a followup to the post from yesterday, I've finished implementing the new Strike Drone model into the game and wanted to give it a quick spin around the block! Of course, I had FRAPS running so, here's a look at the Strike Drone and the in-progress Shield power-up. While your shield is active, no offensive weapons can affect your drone, but it drains your power fast, so don't waste it! 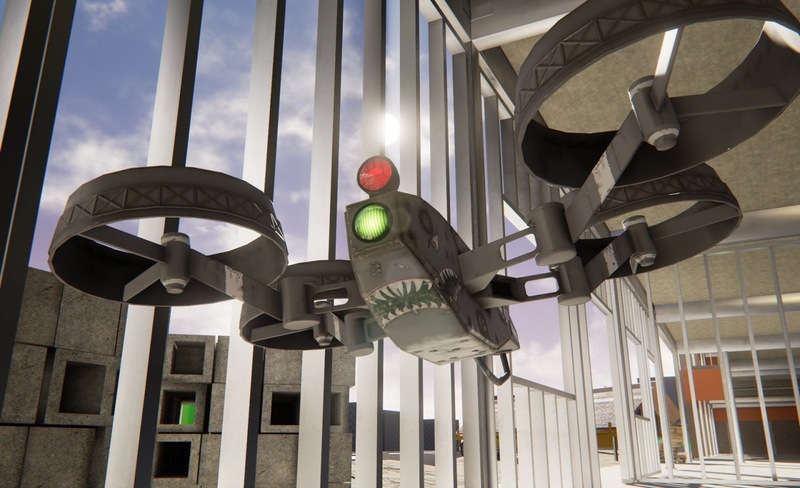 Development Blog #2: Introducing the Strike Drone! 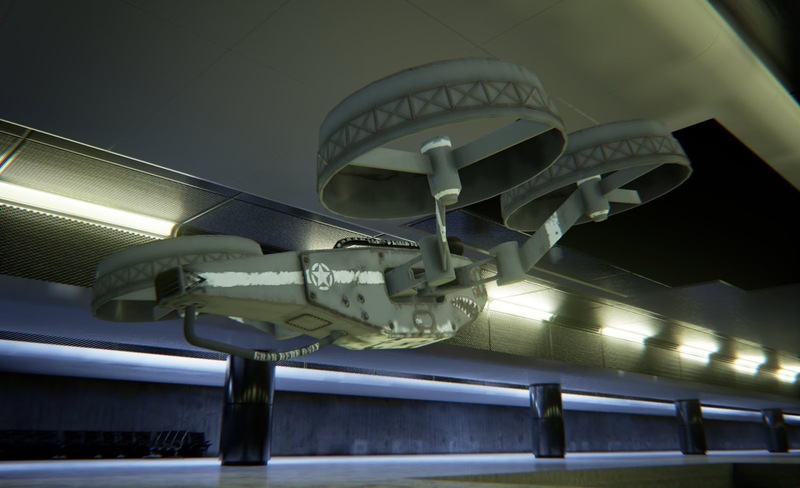 Our Tony Russo has been busy building a BADASS new model and skin for the Strike class of drones. The Strike class is the most maneuverable, but slowest of the four drone classes. When you're trying to quickly navigate the most complex obstacles or outwit your faster, less maneuverable opponents, it's the one you want. His design is based on the A-10 Warthog, my personal favorite warplane of all time, so I'll probably be flying this one around a lot., especially in Hide and seek where being able to get into (and quickly back out of) small spaces is essential for success. DroneZone Development Blog #1: What is DroneZone? Hello all, I'm Tom Shannon, the lead designer on Drone Zone. 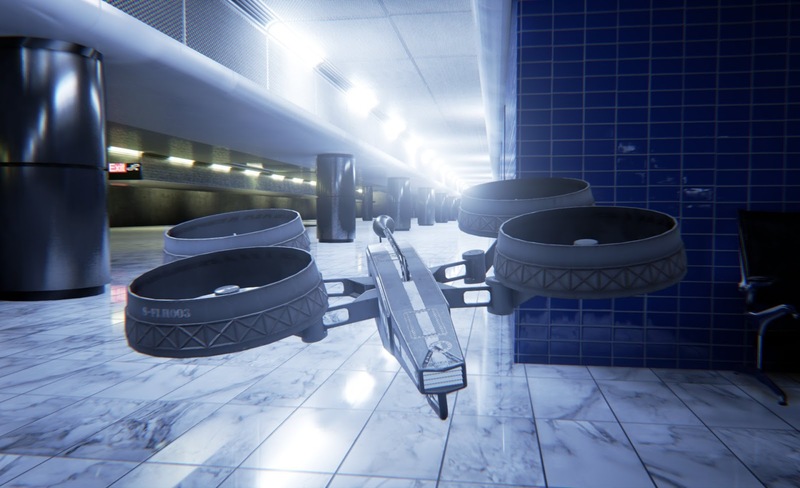 After months of playing with prototypes, learning Unreal Engine 4 and getting a small team together, I'm happy to announce that development on Drone Zone is officially started! While it's certainly exciting and we've got some basic systems in place, the game is pretty ambitious and has a lot of work left on it yet. So, what IS Drone Zone all about? 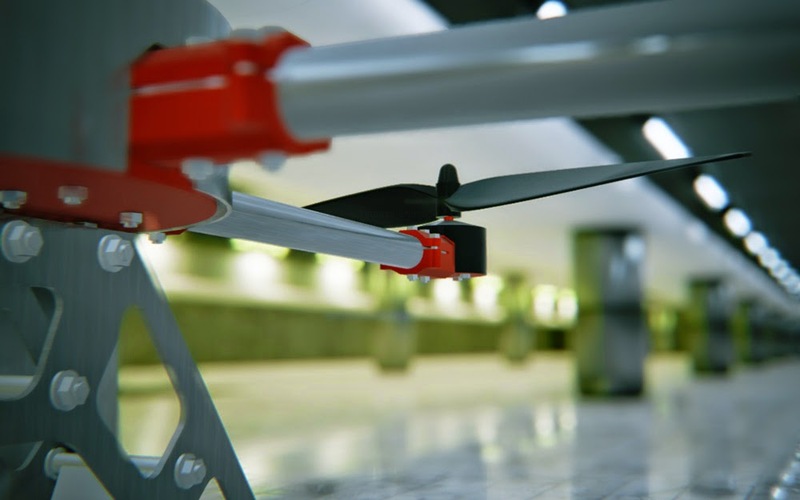 You, the player, pilots a fully customize-able drone to battle friends and strangers in a multitude of intense game modes from Mario Kart style races to capture-the-flag to hide-and-seek style games. You harness a variety of special attacks that range from turbo boosts to EMP blasts that take your opponents out for just long enough to make your move or a shock-wave that sends the opposing team flying away in every direction. The level design is based on real-world locations such as construction sites, hangars and subway stations. The feeling of exploring and playing games in these spaces is fantastic in your nimble little Drone. Choose from several classes of drones to meet your play style; From quick and nimble to heavy and blisteringly fast, match your Drone to your play style and course at hand. Customize your garage of drones with an array of awesome liveries, special effects and other customization that will make your Drones stand out from the crowd. 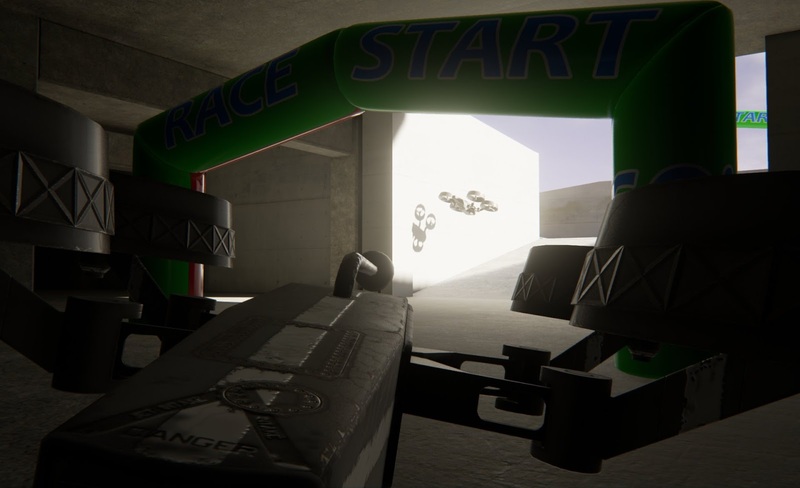 Here's a quick look at the flying mechanics in action in a VERY early build. you can also take a look at the level of quality we are shooting for in the quality of our environments. We'll be updating this blog regularly with new media, development discussions, learning experiences and other tidbits as we ramp up the development of the game. We're still trying to figure out who's going to pay for all this! We're considering our funding options and how we can ensure this game lives up to its full potential. Thanks for coming by and supporting us! We hope you like what you see and have a good time following us as we make this together.